A motion is a proposal by a member of an assembly that the assembly to take certain action. also known as parliamentary motion, It is made with the consent of the presiding officer. • Substantive Motion: deals with most important matter like impeachment of the President or Chief Election Commissioner. • Substitute Motion: substitution of an original motion if dropped and provides an alternative. •Subsidiary Motion: cannot state the decision of the House without reference to the original motion. (a) Ancillary Motion: proceeding with various kinds of business. (b) Superseding Motion: for debate on another issue and takes place of it. •Closure Motion To cut short the debate on a matter before the House. after approval, the debate is stopped & the matter is put to vote. (a) Simple Closure: when a member moves that the ‘matter having been sufficiently discussed be now put to vote’. (b) Closure by Compartments: The clauses of a bill are grouped into parts before the debate, which covers the part and the entire part is put to vote. (c) Kangaroo Closure: only important clauses are debated and voted rest all skipped over as passed. due to a breach of parliamentary privileges by a minister. by a member by withholding the facts of a case by giving wrong /distorted facts. Its purpose is to censure the concerned minister. been in existence since 1954. Draw the attention of the House to a matter of urgent public importance,50 members support is required. involves an element of censure against the government, therefore, Rajya Sabha can't use it. moved to express lack of confidence in the government for any reason. Council of Minister has to resign if it is Passed. 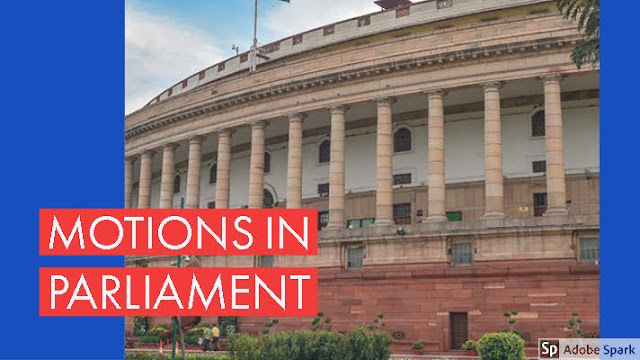 thRadical :Short notes for Competitive exams: What are the various Motions in Parliament ?